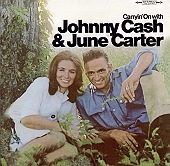 Recorded and released a year prior to the marriage of Johnny Cash and June Carter, Carrying On finds country's first couple dueting and co-writing memorable country music. Included here is the hugely popular "Jackson" (this album was originally re-released as Jackson due to the song's success, which earned the couple a Grammy). A rollicking rendition of Ray Charles' "I Got A Woman" and a soaring version of his "What'd I Say", and the Cash-Carter penned "Shantytown", a melodic number with beautiful harmonies, propel this thirteen song collection (two previously unreleased numbers round out the CD) to the top of the charts. This CD is a blossoming, romantic musical journey of Cash and Carter's love for music and each other, as they work together peacefully and gracefully, creating mesmerizing, timeless country beauty that will long outlast them, as well as you and I. I'll give this an A+.